If you’re looking to save space and reduce manpower and utility costs, invest in a pallet flow rack system in Chino. This storage system is perfect for storage of material with expiration dates. It will enable you to fully utilize all available storage space while keeping the face of your picking aisle fully stocked. This rack system is designed to handle your high-volume item needs efficiently while saving you money. Pallets with product are loaded at the top of an inclined rack and move in a safe and controlled pace to the picking side. 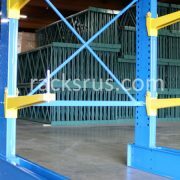 These racking systems are rugged and designed to last for years. This is why they can be purchased from among our used warehouse equipment and still offer several more years of productivity. Industrial shelving solutions don’t have to be boring. When you work with one of our in-house designers, we’ll help you select used warehouse equipment in Chino, CA, that’s functional, sturdy, and guaranteed to provide you with many years of reliable storage. Take back space in your warehouse with our industrial shelves and pallet flow rack system. Our used equipment includes products such as shims, row spaces, pallet back stops, pallet supports, load beams, upright frames, wire decks, and much more. Give us a call today to discuss your industrial storage needs and we’ll provide you with the best shelving solutions. Get your long, awkward loads off the floor and start making the most of your storage space by installing cantilever columns. Cantilevers are an efficient way to make use of all three dimensions of your storage space, allowing you to store product off the floor and up as high as your loading equipment can safely handle. The Racks R Us 12’ cantilever column has a capacity of over 11,000 lbs. When these uprights are combined with strong bases, arms, and braces, the result is a rack system that is ideal for large, unusually shaped, and bulky loads, such as timber, trusses, plywood, pipes, and more. Our expert team in Chino, CA, will help develop your project, use CAD to design a cantilever system that will fit your warehouse perfectly, and handle the installation of your new storage system. The 16’ cantilever column is designed to help you make the best use of the vertical space in your warehouse. Its flexible design allows installation of cantilever arms at varying heights and angles to achieve a custom storage system perfectly suited to your needs. Cantilever column warehouse racking systems are versatile and easy to use. They allow you to move awkward and bulky items off the floor, effectively doubling or even tripling your storage space without adding square feet. Our warehouse in Chino, CA, had a full inventory of columns, bases, and arms. Our design team will create a precise warehousing solution custom-fit to your needs, and our installation team will have you up and running in no time at all. This 8’ cantilever column is the backbone of a cantilever racking system. It’s made from the strongest materials and has a load capacity of over 11,000 lbs. Cantilever arms can be installed at multiple intervals and at varying angles along the column to achieve a custom design. Cantilever racking is an optimal storage solution for awkward, long, or bulky items such as piping, furniture, plywood, tubing, and textiles. Using cantilever columns in your warehouse allows you to get product off the floor and take advantage of vertical space. 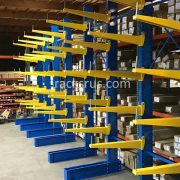 The Racks R Us team in Chino, CA, will help design and install your cantilever storage system to perfectly suit your warehouse space and your storage needs. These 36” rack arms are designed to work with our cantilever warehouse racking system. This storage system allows you to double or even triple your storage space without adding any square feet. Easily store awkward and bulky product up off the floor on these cantilever arms. They are attractive and made from the strongest steel. They can be set in the uprights at different angles to accommodate a variety of different load requirements. Our rack arms are simple to install and make it easy for you to reconfigure your racks as needed. 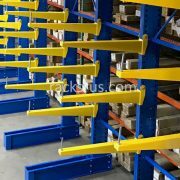 Racks R Us maintains a full inventory of parts for our cantilever system in Chino, CA, reducing your costs and your lead times. You’ll always be able to get what you need quickly. The 48” cantilever arm is designed for use with our cantilever column industrial shelving system. 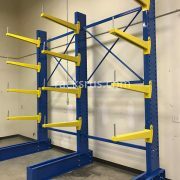 Cantilever column shelving makes use of the vertical space in your warehouse and adds significant storage capacity by getting awkward, long, and bulky product up off the floor, freeing up valuable space. Store plywood, piping, textiles, and other items easily and conveniently on these strong cantilever arms. They are easy to install on the uprights at varying intervals and angles, providing endless configuration options. We carry a full inventory of parts for our cantilever system in our Chino, CA, facility. Our quick lead times will never slow you down! A cantilever racking system creates storage and organization for items in your warehouse that are not easily stored on pallets. The system consists of bases, uprights, arms, and braces that work together to create an easy-to-use space for longer and heavier items that are best stored horizontally across multiple arms. With cantilever racks, you can efficiently use the vertical space in your warehouse and free up valuable floor space. This 48” brace kit includes 3 horizontal braces and one “x” brace. These braces are installed between two uprights to connect them securely together and add extra strength. 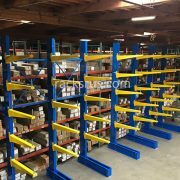 We carry a full line of parts for our cantilever shelving system at our warehouse in Chino, CA, so you will always be able to get what you need. A cantilever industrial racking system consists of four basic components: a base that sits on the floor, tall uprights, cantilever arms, and braces for additional support. The base extends out from the bottom of the rack and is very heavy so it can counter-balance the weight of the items stored above. The uprights are strong vertical posts that support the arms, which are the shelves that extend from the uprights. Braces connect the uprights securely together and give the racks extra strength. Cantilever shelving makes use of the vertical space in your warehouse and is an excellent storage solution for challenging products such as timber, carpets, pipes, and furniture. Cantilever shelves are also excellent racks for used pallets. This brace kit consists of 3 60” horizontal braces and one “x” brace. 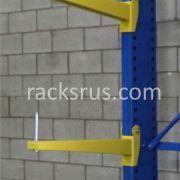 Racks R Us in Chino, CA, is committed to providing you with the best industrial storage solutions. Warehouse space is valuable. 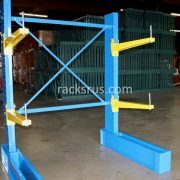 Racks R Us understands this basic truth and is committed to providing excellent new and used industrial racking systems for warehouses of all kinds. Our cantilever shelving system is an extremely versatile solution for storage of awkward and bulky products such as carpets, timber, pipes, and used pallets. The system consists of upright columns, cantilever arms, heavy bases, and braces for extra support. All the components are available in a variety of sizes so the completed system can be customized to your exact specifications. The 72” brace kit is a set of 3 72” horizontal braces and one “x” brace that will attach the columns together securely and add extra strength to the system. Our Chino, CA, facility always has these in stock, so we will never slow you down. Do you need more warehouse space? Cantilever shelving might be the answer to your overcrowding problems. This versatile shelving system has four main components: a heavy base, upright columns, cantilever arms, and braces. The system is fully customizable and can be built to perfectly accommodate your storage needs. The best part is that it gets the bulky, awkward, oddly-shaped product off the floor. Just like that, you have the additional warehousing space you need. 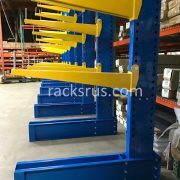 Racks R Us sells new and used cantilever racks from our warehouse in Chino, CA. This brace kit includes 3 horizontal braces and one “X” brace to connect the uprights together and add extra strength to the system. A cantilever shelving system is an efficient way to use all the space in your warehouse. The principle behind cantilever shelves is simple: the cantilever arms shift the weight of the load to the uprights and the weight is counter-balanced by extremely strong steel bases. The length and strength of the base determines the length and strength of the arms that can be used. Cantilever arms can be mounted on one side of the upright or can be mounted on both sides with a double base. 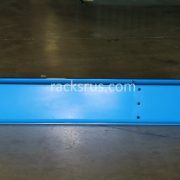 Racks R Us in Chino, CA, offers a double base cantilever for sale. This 109” long steel base is made for use on a double-mounted shelf with 48” long arms.